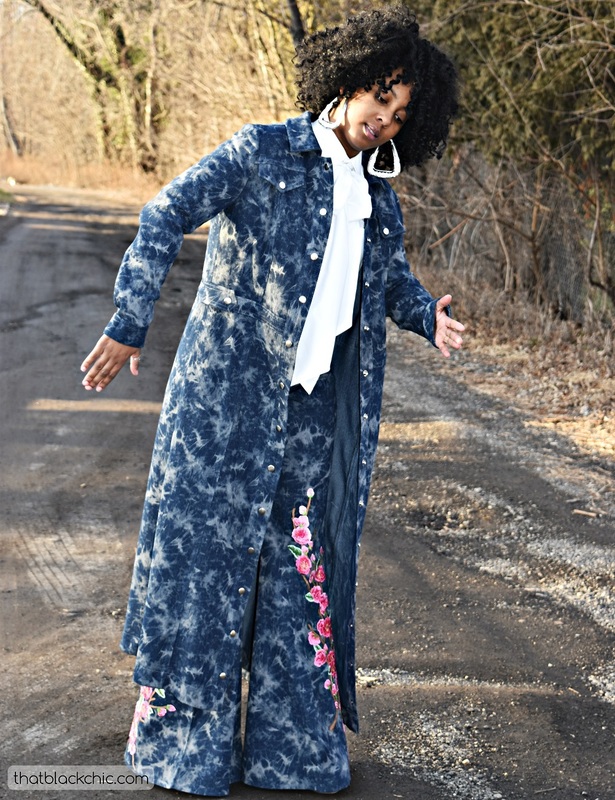 So, I read somewhere that January was denim month, I don't know if it's true or not but I playing along here. 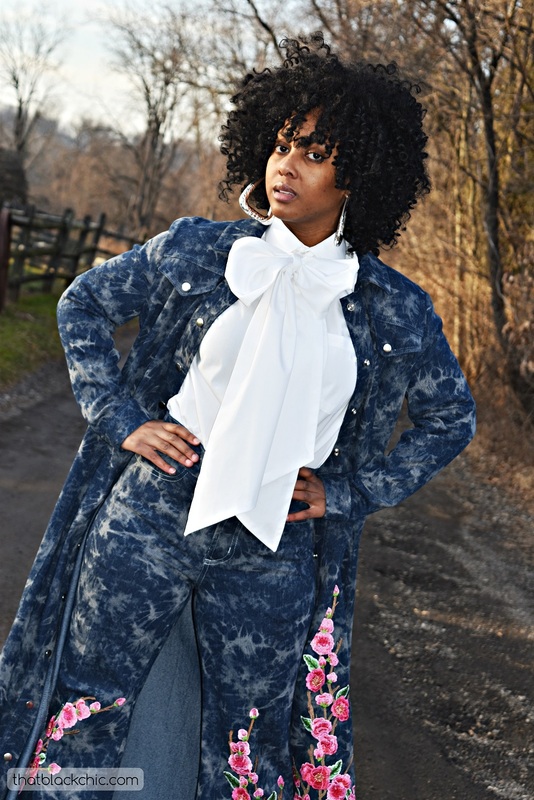 As you all may know that denim is my thang and I love to sew it, wear it and re-fashion it every chance I get. 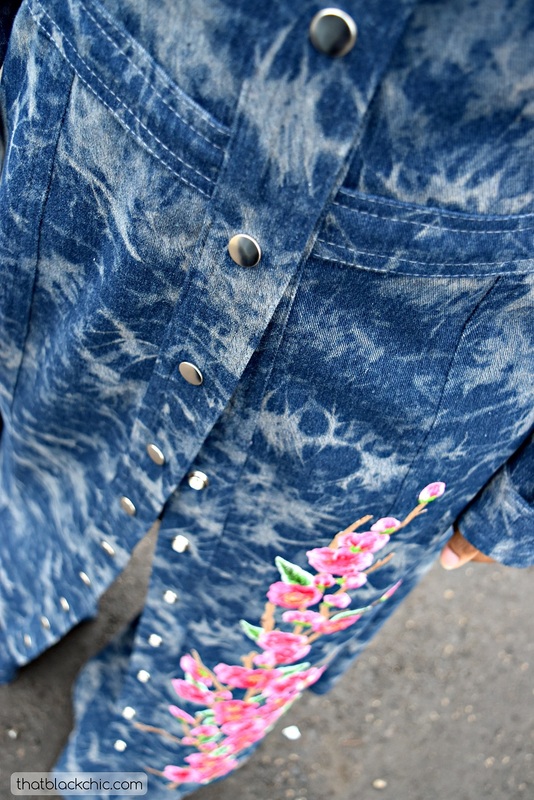 I am going to try and cram as many DIY denim posts this month as I can. 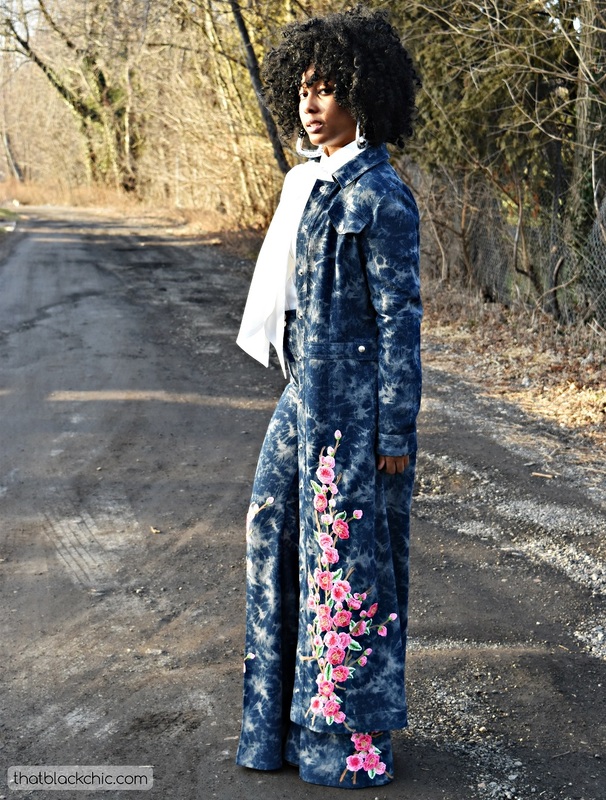 My first DIY denim for January is this Ode' to Alice & Olivia a DIY denim maxi coat and DIY denim jeans. 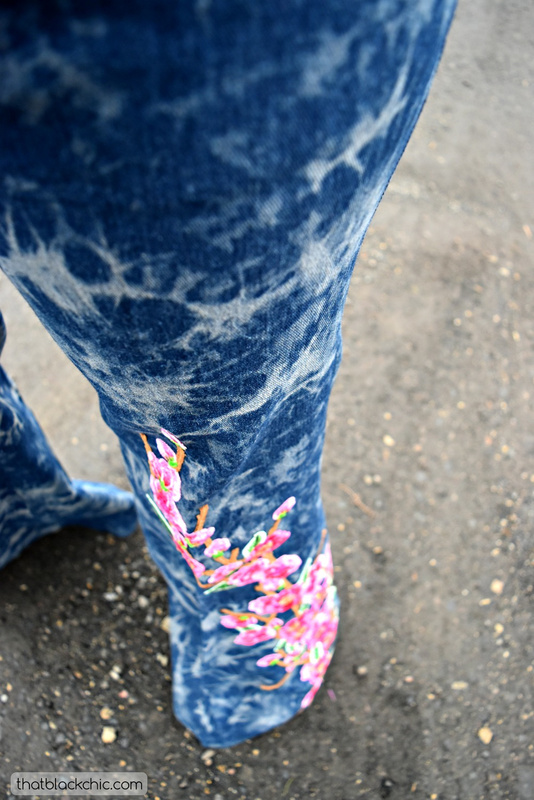 I saw these amazing jeans with embroidered flowers all up and down the legs and I was smitten. Now since there was no way I was doing all that embroidery by hand and I am not well versed in embroidery on my machine, I did the next best thing. I bought a few embroidered iron-on patches! Brilliant right???? I thought so. I Googled and found a few winners on Etsy but weren't that cheap. I bought 3 large flower patches for this project and they were $22.99 each plus $8.00 for shipping. [That's not cheap to me but I needed them so I bought them] If this is something your interested in, check Amazon because they have some that were cheaper than these, of course I found this little bit of information too late but I know where to check next time. 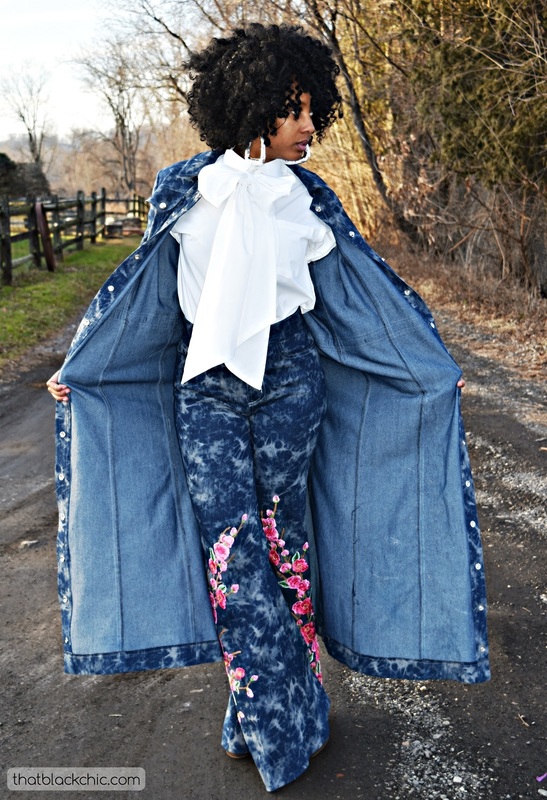 Oh and before you ask the question, the denim fabric was from Joann's. 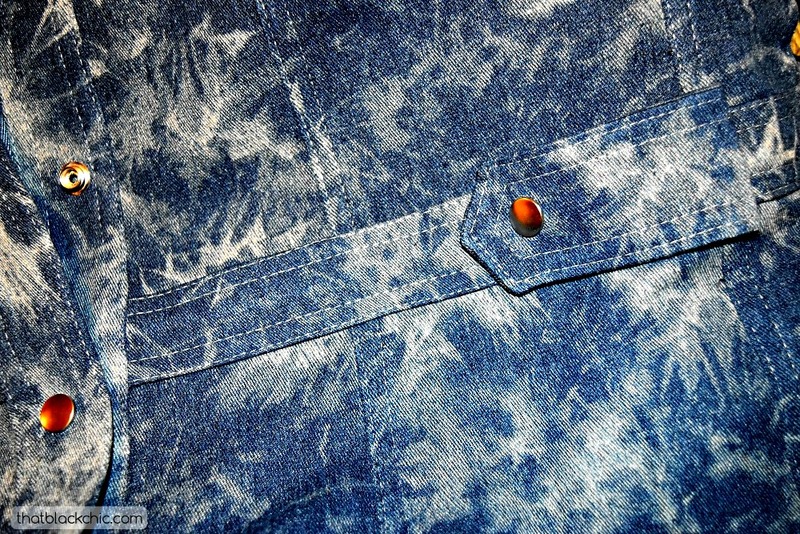 If you didn't get this tie-dye denim when they had it you missed out! I have a lighter shade as well. Now I had to figure out a way that I was going to sew these babies on my fabric. They said they were iron-on but I'm guessing unless I had a professional heat transfer they were not iron-on! I went out and bought three different adhesives for this task because I didn't know what was going to work. I stopped with the first product because it worked like a charm. I used Dritz Liquid Stitch Adhesive. This process was tedious and it took a while. You have to glue all the parts down and then sew them. After figuring out how to apply the first patch the last twp went a little smoother and it was worth it! Allrighty let's talk about the patterns that I used and how I hacked them. 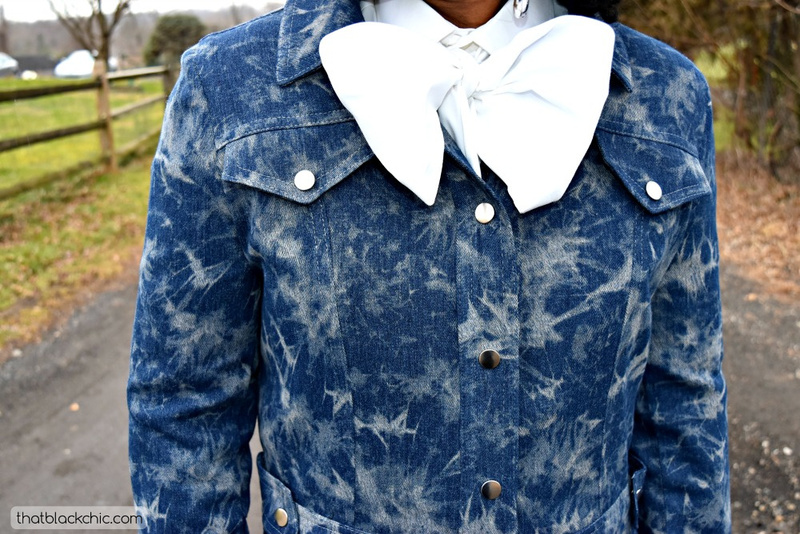 The Big Bow is a tie-on DIY that you have seen before. 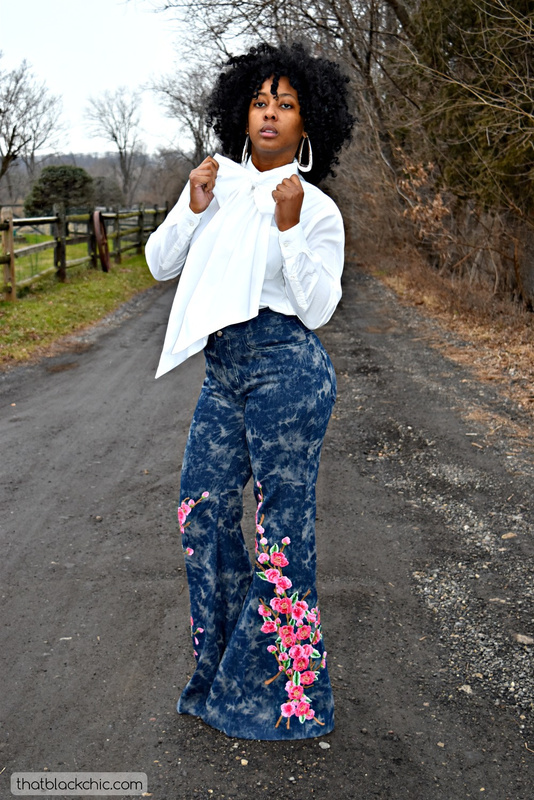 [if it ain't broke them you don't fix it] For the jeans I used my favorite jean pattern the Birkin Flare pattern, I just added more flare to the already flared bottoms to make bell bottoms. It ain't for everybody but it was my vision for these jeans. [I may take away some of the flare after this post, although I love it, I think Mori would like them better with a little less flare and a little tighter.] 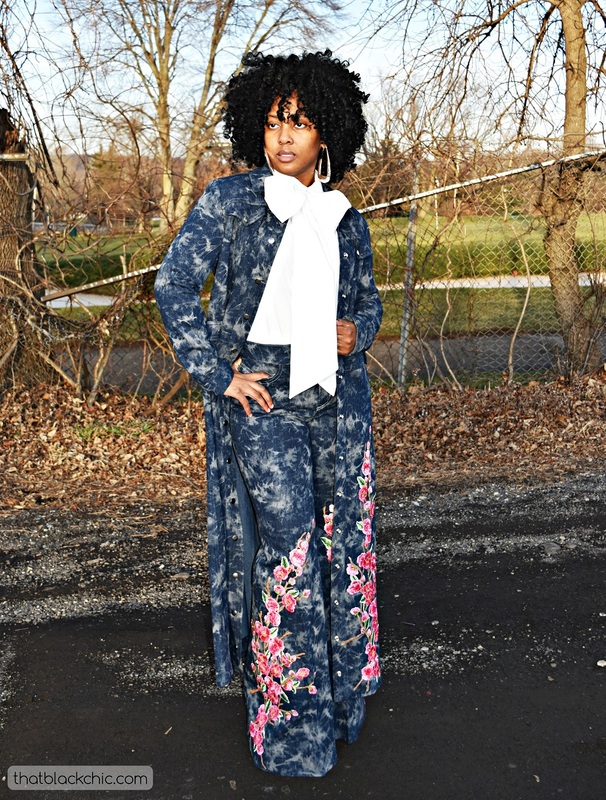 For the jacket I started with Burda young 7018 I just added the maxi coat length with a little flare to each panel. I also added tabs on each side, just for decoration. So there you have it folks, parches can work for your designs. I got a few more patch designs coming up for ya. We're going to close this post with a little Robot for ya! You see these are the pics that we usually don't post but she kept doing it and I told her to stop soooooo this is what she gets! Thanks Ruqayyah! Looking forward to see what you do with yours. I am in love with this whole look. You did an incredible job! Your detailed review is great. 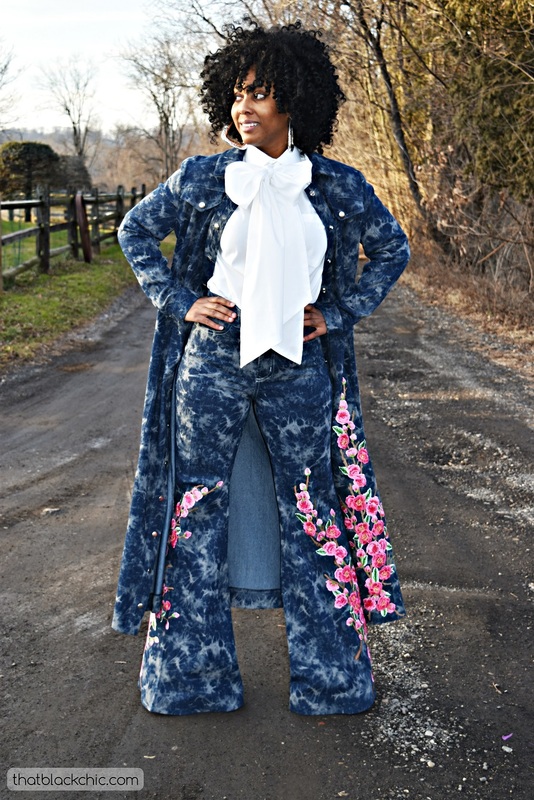 As I suggested in the Amazing Sew a long group, this reminds me of the outfit Prince wore in Purple Rain. Kudos! Alethia, thanks gurl! And I totally get the prince reference although I didn't think of that as I was creating this but I do get it. That outfit is amazing. Love the robot picture, you guys are quite the duo. Thanks Tanya I agree we are a great team. Thanks for stopping by. Thanks Cunni, this was a great start to my makes for 2017....even though I really started it in 2016. Those patches were a beast. Both pieces are fabulous! Excellent sewing. I'm impressed! You never disappoint! 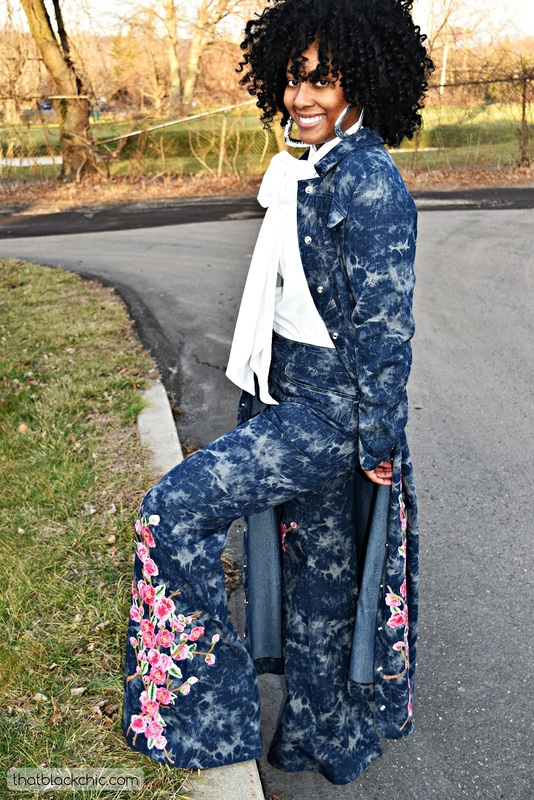 The whole look is fabulous! Great job. Thanks Kaye, I love using patches! The outfit is gorgeous! 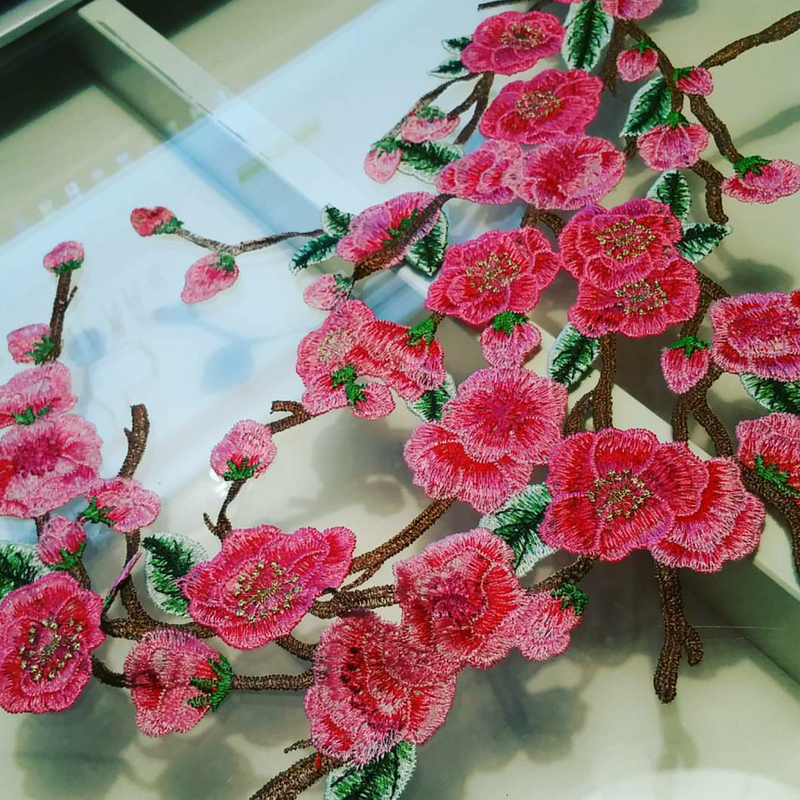 love, love, love the appliqués. Though may I ask a question? Did you install all the snaps yourself? Or did you have them professionally done? And if you did them yourself what snaps did you use? Thanks! I thought so but I had to ask? You did a wonderful job on those snaps! Amazing as always. 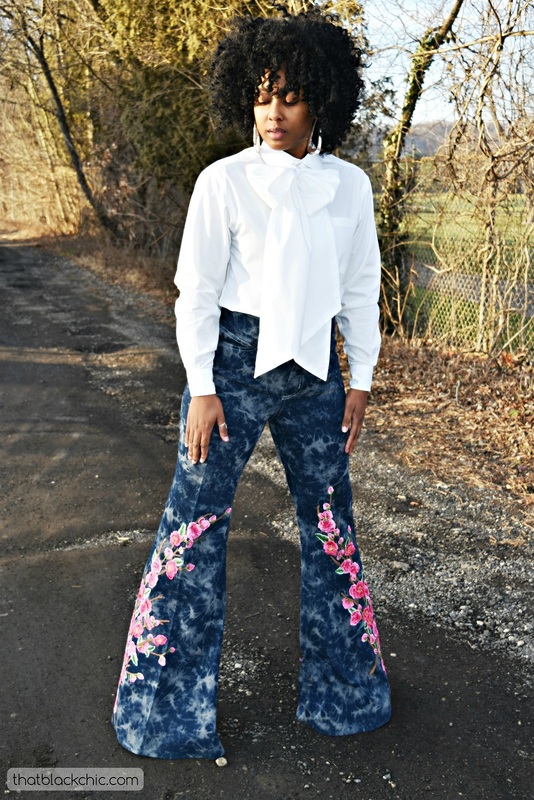 Where is the pattern for the blouse? The blouse is just ready to wear. I'm getting the Prince vibe too, but in a much prettier and girly-er way. What a fantastic outfit. All that work paid off!! Thanks Debbie, I love the way it worked out. Thanks, she's pretty funny once she gets started! WOW!!!!! three words: DROP THE MIC! I have been following you for quite some time and always get excited when I get a notification of a new post. I used to sew all of the time for my daughter, but rarely ever for myself. My daughter is grown and out there in this big world living it up, while my sewing machine collected dust in the garage. I recently joined a Krewe, and our theme is 1950's glam. I'm am sure you know that 1950's dresses are not sold in ever store and a vintage store is out of the question because I don't believe that women from that era ever ate. So...a dilemma. After viewing your last postime, another beautiful creation, I decided to break out my sewing machine and make myself a dress. While my first dress is less than desirable because of fit issues (any tips on this subject appreciated), I am still proud of myself for trying. I just wanted you to know that you inspired me to try. Wow Cheryl you got me all fuzzy over here! You don't know how inspiring you, inspires me! Since you just dusted off your machine I hope the dress you started with was one that was easy to sew. You need to take baby steps so not to discourage yourself. 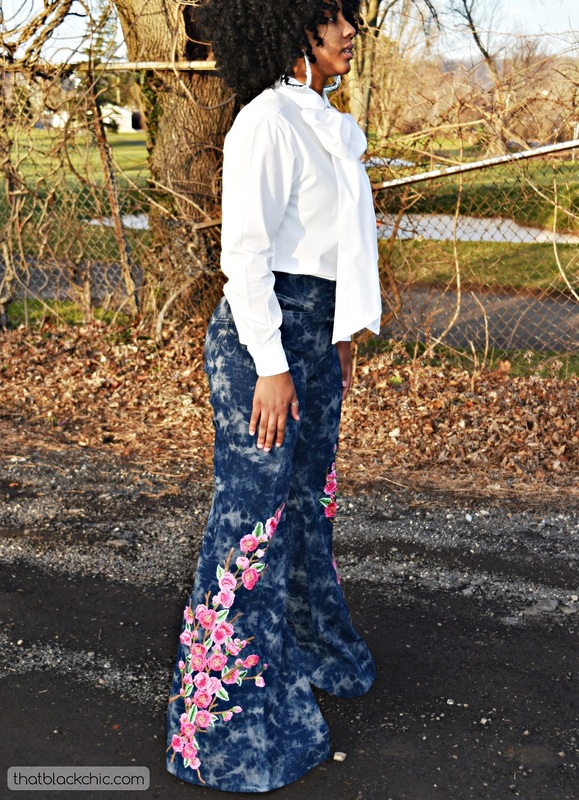 How about a well made skirt? You can easily work out fitting issues with a skirt. 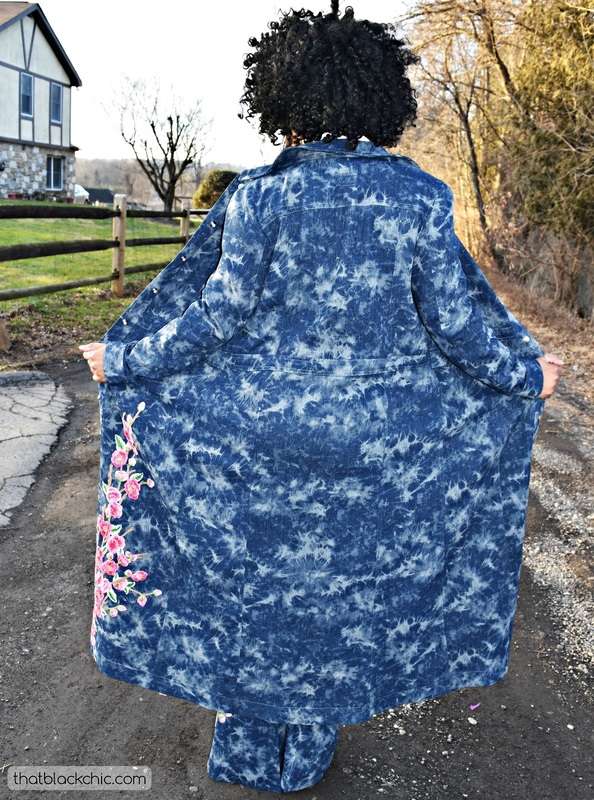 email me at michelle@thatblackchic.com and I think I have a great pattern for you. Michelle! This is beyond WORDS! All I can say is "You're too MUCH!" I'm doing my Hammer dance right now...can't touch this...whoa..stop! Thanks so much Anita! YESSSSs BABEEEEEEEEEEE in my Debbie Allen from FAME with Leroy VOICE!I luvvvvvv every single thing about this look! 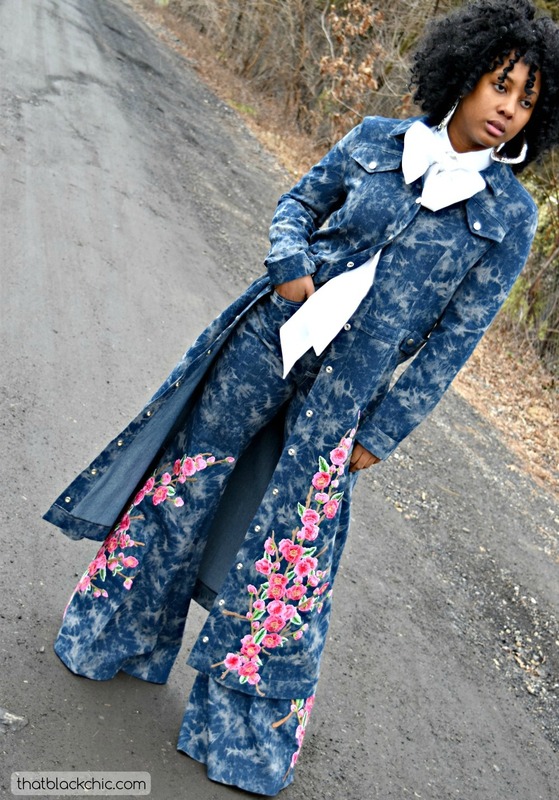 You got me wanting to make a denim coat and break out my birkin jeans pattern that I have yet to sew! #youdidthat ROCK OUT Mori ROCK OUT! I swear if I had something in my mouth when I read this it would have been on the floor, you hear me?? I so appreciate your references cause Leroy was my maaann! And yes you need to get to making those Birkins! YASSSS!!! Babe you are a beast! Chile, I'm tryina be on your level! Reminds me so much of the outfits from the 70's. 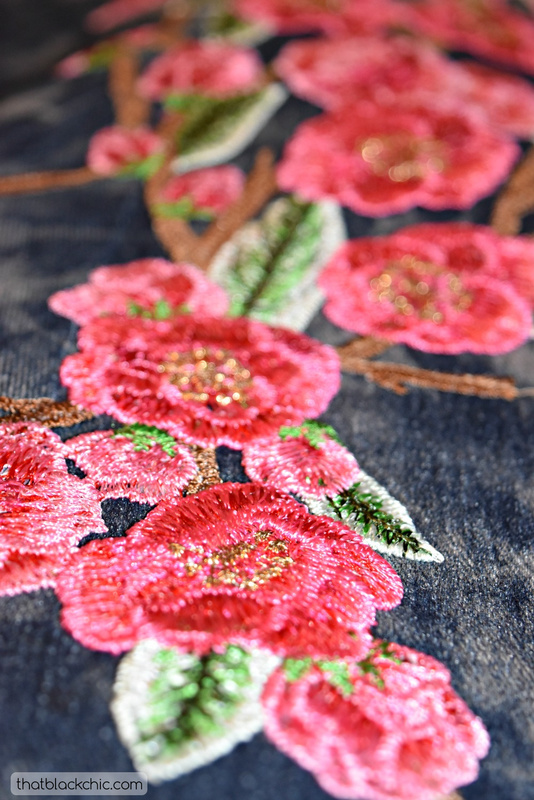 The embroidered patches are the icing on an already fabulous cake! Mori is so blessed to have you as her personal designer--she's quite the fashion icon and wears it well. Robin the 70's is always calling me! My daughter does not particularly care for all the 70's looks that I make but she does wear them well. Thank for the yummy review! I saw your post through the amazing sew alongs and I'm so glad. I saw a Nordstrom post with some jeans that had the embellishments and thought I had to go save my pennies for an embroidery machine. But you did it, you recreated the look. I love the bow, it's romantic and elegant. The whole styling and all the proportions are perfect on you, I love it. P. S. Your hair is gorgeous! 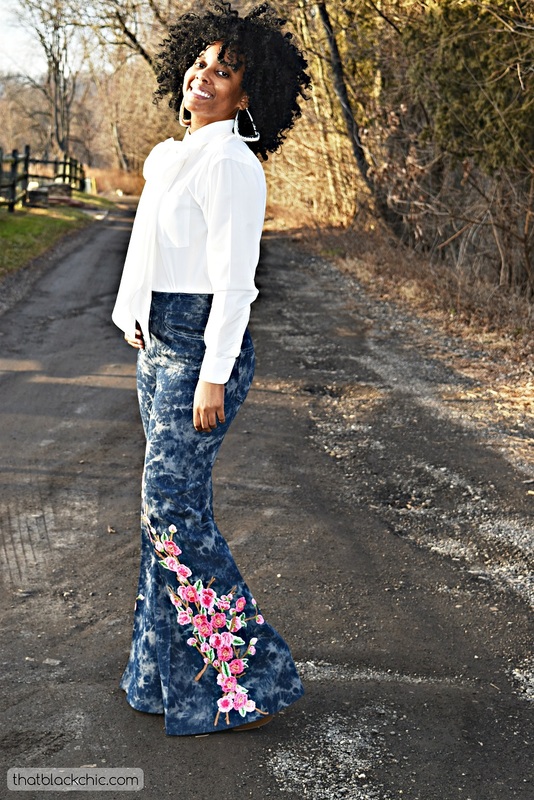 Thanks Stephanie, girl when I saw how much those Alice & Olivia jeans were I almost fainted! I knew there had to be way, although my machine does embroider but I have never test driven it. The model is my daughter, Mori. Hi Michelle, I keep stumbling across your blog through other bloggers, and could not pass through this time without giving you your due. Fabulous from head to toe. Everything about this ensemble screams PERFECTION!!! You've got skills gurlll!!! Sandra, I'm mad you keep stumbling through by way of others! Why come you ain't checking me out on the regular, I trought we was homies! Just kidding but really how come you're not subscribed? ?